Ignore Everything We Told You Last Week And Do What We Tell You Now. 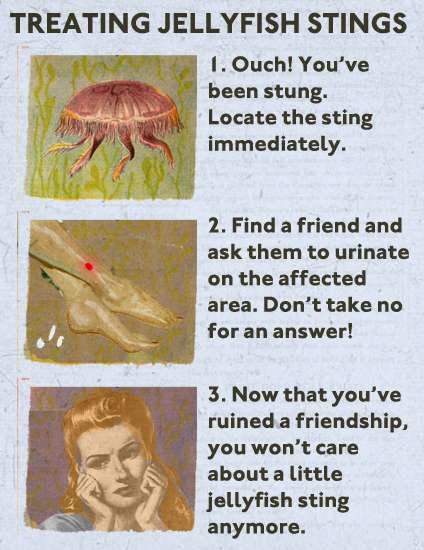 The Advice On Jellyfish Stings Changes Again! 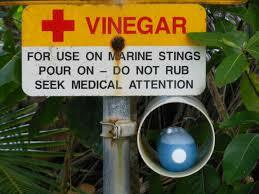 What is the correct first aid treatment for jellyfish stings? Finding this out can be a confusing experience. Just typing “first aid for jellyfish stings” into a web browser throws up a wealth of information, the majority of which is utter bull crap, or at least we thought it was. We were confident, you see, that we knew exactly how to treat a jellyfish sting and having added shaving cream and various condiments to our first aid kit, we were pretty certain that we had covered all the bases and were prepared for anything the gelatinous little buggers could throw at us. What we weren’t expecting however was for everything we thought was right, to be proved wrong, and vice versa. Yet that is exactly what has happened and it’s not just us who’ve got it all wrong. Thanks to the work of some white-coated brainiacs in Hawaii and Ireland, some very authoritative sites including the British National Health Service and Diver Alert Network are going to have to revise their advice too. The problem is all to do with Portuguese man-of-war. Ah you might say, but a man-of-war is not technically a jellyfish so those brainiacs are barking up the wrong tree all ready. Technically you’d’ be right. A Portuguese man-of-war is a Siphonophore not a jellyfish. However in this instance it makes no difference as Portuguese man-of-war belong to a family called Cnidarians, which include Jellyfish, Hydrae, Anemones and Corals. The tentacles of these Cnidarians contain tiny capsules called Cnidae or nematocysts and it is these toxin-firing structures that cause all the pain and suffering to unwary humans. The advice that the most authoritative websites give on treating Portuguese man-of-war stings was not to douse the stings with vinegar or alcohol as this made more nematocysts fire and consequently things got worse for the victim. On the other hand, if you knew that the critter that stung you was a notorious Box Jellyfish, then the advice was to drown the affected areas in so much vinegar that the whole place smelt like a Sarsons factory. Confused? Why wouldn’t you be? But things get worse. Some sites suggest that you use baking soda, alcohol, or lemon juice and the myth of urinating on the affected area still persists in places. The British National Health Service (an authoritative organisation, you’d all agree) suggested that the area should be treated with shaving foam and then remaining nematocysts/tentacles scrapped from the skin using a credit card. If shaving foam wasn’t at hand then rinsing with seawater was a good substitute before you got to work with your American Express Card. Now however Dr Angel Yanagihara of the University of Hawaii and Dr Tom Doyle of the University of Galway, Ireland and their colleagues have put these treatments to the test. Their findings, published in the Journal Toxins, revealed that almost of all the suggested treatments were utter codswallop and the only effective treatment was in fact vinegar. And it doesn’t matter if it’s a sting from a Portuguese man-of-war, a Box Jelly or a Mauve stinger, the best first aid is to rinse with vinegar to remove any residual stingers or bits of tentacle left on the skin and then immerse in 45°C (113°F) hot water or apply a hot pack for 45 minutes. As for the use of shaving foam, Yanagihara, Doyle et al, found that shaving cream didn’t inhibit the nematocysts from firing and the use of credit card “shaving” produced further firing due to pressure. Doyle himself explained that “this is Quite a u-turn for me” as he helped write the current Irish protocols almost ten years ago, which unfortunately recommend the worst possible combination of steps: seawater rinsing followed by ice pack treatment. "In the coming weeks, I look forward to meeting with members of the Jellyfish Advisory Group to discuss our new findings and how we can revise the current protocols." He said. 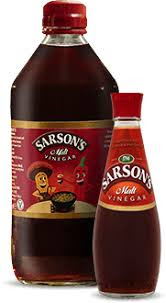 Now before any of you get too clever and start asking silly questions such as what type of vinegar should we use? And is distilled as good as malt? What about white wine vinegar or sherry vinegar or that stuff the French call wine – Beaujolais isn’t it? That’s vinegar most of the time isn’t it? The simple fact is that vinegar, any sort of vinegar will do. As long as it’s not diluted – which means straight from the bottle chaps. The research also pointed out that use of ice packs should be discontinued and only vinegar followed by heat immersion or the application of hot packs are effective. Now we know that some of you sharp-eyed types out there might have spotted the name Yanagihara and thought to themselves, “hang on”. “Isn’t that the same Dr Yanagihara founder and principal of Alatalab Solutions, LLC, manufacturer of Sting No More®products”? And you’d be right, she is one in the same. But before you start concocting conspiracy theories about the contents of Sting No More products and the possibility Dr Yanagihara might be the secret owner of a large vinegar manufacturing plant, let us be clear that Yanagihara has already declared a potential conflict of interest as the inventor for USPTO applications PCT/US2012/000095 and PCT/US2015/037974. A.A.Y. and as the founder and principal of Alatalab Solutions, LLC, manufacturer of Sting No More®products. The University stated: management of this disclosed potential conflict of interest was achieved under an approved University of Hawaii Conflict of Interest (COI) plan. All aspects of the COI plan were followed while conducting this research study and in the independent analysis of data. No other member of the group declared a conflict of interest. No. We have no idea what all that means either but we suppose that no one at the University thought there was a problem so why should any of us? Anyway, Yanagihara et al have already started studying the next stinging jellies on their list. As they've examined two of the three main classes of dangerous stingers, they have their sights set on the last remaining class: true jellyfish (class Schyphozoa). Again collaborating with Doyle, they are working on evidence-based first aid measures for lion's mane (Cyanea capillata), one of largest jellyfish in the world. Which means of course that all this advice might change in the near future. But then there are few things in life you can depend on other than the fact that you are born, you will pay tax and you will die. Oh and that scientists will be adamant about their findings right up to the point they’re contradicted. Until then however we will be revising our advice on our snorkelling hazards page to take account of this research and look forward to revising it again in the near future. Those of you who’d like to read the full research paper can find it here. Is That Shiny New Gadget Really Worth Investing In? Is This An Investment Opportunity? In the olden days, if you had invented a new revolutionary device that would allow someone to breathe underwater or even a couscous based beauty product, you only had a few ways of raising the necessary finance to get your shiny new product from the drawing board to the shop shelf. You could ask your friends and family for the money but then you wouldn’t have any friends or family. You could remortgage your house, sell your kidneys or your children or as a last resort you could sell your soul to a bank and take out a loan. The result of this was that a lot of houses got re-possessed, people were sent to work houses and very few shiny new products ever made it onto those shop shelves. Nowadays though, thanks to the idea of crowdfunding, wannabe entrepreneurs everywhere from Tokyo to Timbuktu have the opportunity to pitch their idea to millions of potential investors around the world. Crowdfunding has been a great success but let’s be honest, for every brilliant idea out there, there are thousands of really, really bad ones. For just as crowdfunding is an opportunity for inventors to showcase their revolutionary new products it also offers the opportunity for the more delusional among us and, of course, the downright dishonest to pry some money out the over trusting and unsuspecting alike. Is It An Underwater Gill Or A Motorcycle Handle? “A state-of-the-art oxygen respirator, that allows you to breathe underwater up to 45 minutes and at a maximum depth of 15ft by utilising our ‘artificial gills’ technology & liquid oxygen technology. Swim among tropical fish, marvel at exotic coral and experience the serene beauty of marine life without having to come up for air. Welcome to Triton." Fortunately in May 2016 the people at Indiegogo, having made numerous unsuccessful requests for the Triton team to substantiate their claims, suspended the campaign and refunded all the contributions made (although they have relaunched a new campaign explained in the link). Which was good news for all those investors that, despite the quite obvious flaws in the claims and the fact that a revolution would need to take place in the fields of engineering, materials and molecular chemistry for the Triton to actually work, parted so easily with their cash. Obviously the Triton case is an extreme example but scams and dodgy inventions are not the only thing the wannabe investor should be wary of. Sometimes it is not the product that is the problem, but the way it is being marketed. Take for example an idea that has recently caught the attention of snorkellers, freedivers and bubble blowers alike. The device is called Scorkl and has recently appeared on the Kickstarter site. 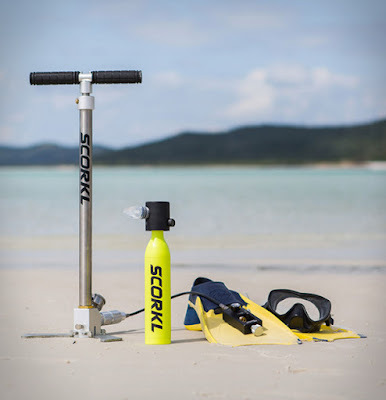 According to the marketing blurb, Scorkl is a self-contained breathing apparatus that offers anyone the chance to breath underwater for up to ten minutes at a time, longer if you buy more than one. Hey you could even buy six or seven and stay under for sixty or seventy minutes and you don’t need a compressor to fill these things up, since you can buy a hand pump that will do it for you. Now let’s make it clear that, unlike the Triton, the Scorkl does actually work. The reason we know this, is the fact that it is what is known as a redundant air supply system and looks remarkably similar to SpareAir, which is offered by submersible systems and has been on the market for 25 years. In fact the Scorkl looks so much like SpareAir that trademark and patent infringements are very possible. 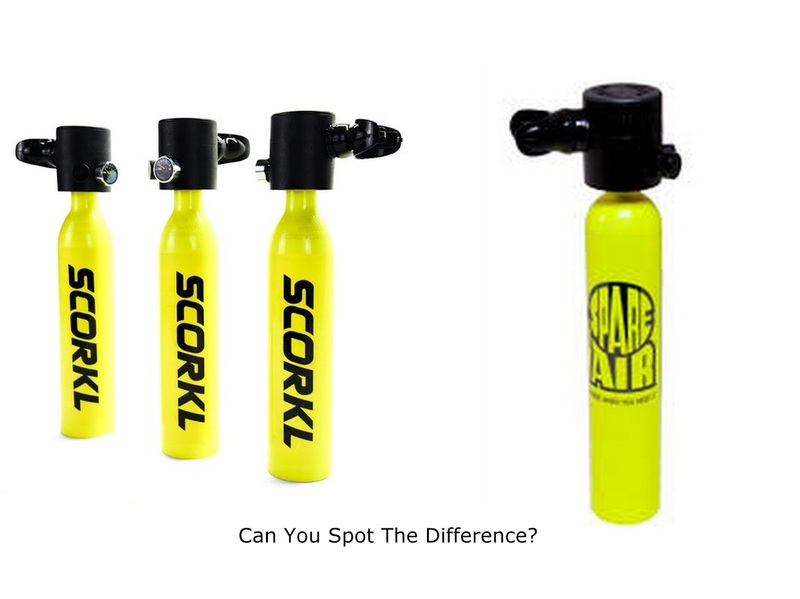 Scorkl then is not a new idea as such; it is in essence a small SCUBA tank fitted with a regulator, which as mentioned above has been on the market in the form of SpareAir for 25 years. What is new is the idea of using a hand pump to fill up the tank and there are some rather big questions on whether that actually works or whether it’s a safe idea at all. There are also some issues surrounding the claims made about the amount of time you can spend underwater using the Scorkl or how deep you can go. According to the Scorkl inventor, David Hallamore, "it's easier to say 'up to 10 minutes' because it's easily understandable, but it's a complex equation and how long you spend underwater on a Scorkl full of air will depend on how fast you are breathing, how big your lungs are, how hard you're working, how cold it is, ... so it might be less than 10 minutes. It might also be more, and maybe a lot more depending on how you use it. The Scorkl, Hallamore explains, contains 3 cu ft when filled to 3,000psi or roughly 60 breaths. The "up to 10 min" calculation works as follows: At 3,000psi the Scorkl holds the equivalent of ~60 breaths. An inhale/exhale cycle of 10/min (1 every 6 seconds) allows for ~6min underwater at 1 atmosphere. A slower cycle of 6/min (1 every 10 seconds) allows for ~10min. The problem with this calculation however, is that according to health professionals everywhere, the average person takes 16-20 breaths per minute, more on exertion. That means that at 20 breaths per minute the Scorkl will last just 3 minutes. At 16 breaths per minute it will last an extra 45 seconds and since everyone is already under 1 atmosphere of pressure before entering the water, both of these calculations are based on surface breathing without exertion. So the 10 minutes of air claim only makes sense if the user is a very fit and very experienced diver sitting on a beach or maybe a hibernating tortoise. Then there is the question of the hand pump used to fill the Scorkl. How long do you think it will take an average person, breathing averagely, to pump enough air to fill it to 3000psi? Well, according to Hallimore, it takes around ten pumps per breath to fill the Scorkl (600 pumps). It gets harder to pump as the pressure in the tank increases but it is manageable for an adult. A steady pumping rhythm of 50/min fills the tank in 12 minutes. Most people will want to rest intermittently though which allows the tank to cool down. Ah! so you might not want to pump too vigorously or persistently just in case the damned thing explodes before you actually pass out from exertion. Now, despite the Scorkl’s similarity to another product, the questions of how long it will take for an average person to run out of air or whether you’ll suffer a coronary whilst trying to refill the bloody thing, the real problem is none of these. The real problem is that the Scorkl is seemingly being marketed at snorkellers, swimmers, boating enthusiasts and everyone in between. The problem with that is that no matter if you fill the Scorkl with a hand pump or a compressor, it will contain compressed air and if you are not aware of the dangers of using compressed gas underwater there is a good chance your lungs will go pop. If you’re a bubble blower please bear with us, if you’re not a bubble blower please pay attention because here comes the science bit. Boyle's law explains why changes in depth while in shallow water can be more hazardous than equivalent changes of depth in deep water. In essence, British physicist/chemist Robert Boyle discovered that at a constant temperature and mass, the volume of a gas is inversely proportional to the pressure exerted on that gas. When the pressure is doubled, the volume is reduced to one-half of the original volume. Conversely, when the pressure is reduced by one-half, the volume doubles. While exposed to atmospheric pressures at sea level, our lungs are in a state of equilibrium as we inhale and exhale. Slight pressure changes occur as we change elevation, yet equalisation of the pressures inside and outside the lung is a passive and inconspicuous event with each breath. During descent into water, all gas-containing spaces in the body tend to shrink as the pressure surrounding the body increases; for example, the lung volume of a breathhold diver becomes smaller with the descent in the water column. Because scuba regulators deliver breathing gas at the ambient pressure of the diver, a higher concentration of the breathing gas enters the lungs, preventing the reduction in volume that would otherwise occur. If the diver does not exhale during ascent, the lungs will progressively increase in volume until the elastic limit of the alveoli is exceeded and lung injury occurs. This forces gas into one of three locations: 1) the space within the chest cavity (pleural space), a condition known as pneumothorax; 2) the tissue planes within the lung itself (interstitial space), from where it may travel into the space around the heart, the tissues of the neck and the larynx (mediastinal emphysema); or 3) the blood. In this latter condition (arterial gas embolism, or AGE), gas bubbles can then pass from the pulmonary capillaries via the pulmonary veins to the left side of the heart and then to the carotid or basilar arteries (causing cerebral arterial gas embolism, or CAGE). It is important to note that a breathhold ascent after inhaling from a scuba tank from a depth as shallow as 4 feet (fsw) may be sufficient to tear alveolar sacs, causing lung injury and one of these three disorders mentioned above. Well, you might say! That’s all right then. People are going to be informed of the risk. After all what sort of person would misuse a Scorkl anyway or ignore a warning? To which we would reply, perhaps the sort of person who doesn’t read or even ignores information kits. After all, people have been warned of the dangers of smoking for decades and yet people still smoke. And then there are the sorts of people who invest nearly a million dollars in a device that was, and still is, even less genuine than an Estate Agents smile. 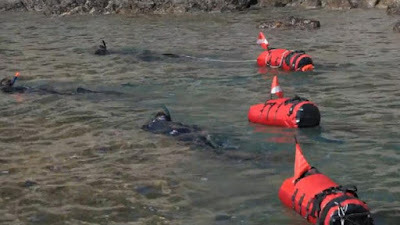 There is a solution of course and that is not to sell the Scorkl to non-SCUBA trained people but we suspect that is not what the company is going for. So any investors out there might want to think very carefully about the safety implications of such a device being available to everyone, everywhere, before handing over their money. So what have we learned? Well what we’ve learned at the DSC is that a fool and his money is easily parted and that if we were going to put our money into a crowdfunding project we’d take a long look at what the idea is, whether it is feasible or plausible and not likely to explode in ours or anyone else’s face for that matter. And, if it sounds too good to be true it probably is. If you didn’t already know this then we’re happy to impart our advice. If you did know, we’re sorry to have wasted your time and suggest you get back to your beer, Cheers! Don't Go Sea Treking, Go SeaTrekking! We had never heard of Sea Trekking and when we did, what came to mind was a picture of fat tourists, large surface-supplied helmets framing their terrified faces, groping their way along a submerged guideline. This, they would undoubtedly have been told when they parted with their hard-earned cash, would be an undersea adventure like no other. It’ll be like you’re Captain Nemo undertaking a fantasy walk beneath the waves just like in the Jules Verne classic. Sea Treking requires no swimming ability, no previous experience or specialised skills. Just descend into the water, travel along the pre-set route and enjoy the “once-in-a-lifetime adventure” of being surrounded by marine life of all shapes and sizes. Yawn! Of course, more often than not, the helmet-encased tourists stir up so much sand and sediment as they haul themselves across the seabed that the fantasy adventure soon turns into a hellish walk where the only thing visible through the murk is the odd wrasse flitting between the clouds of silt and bubbles. And not all the bubbles come from the same ends…. We cannot think of a more horrendous way to spend thirty minutes of our life than to be herded like cattle across the sea floor, our heads enclosed in a cyberman’s helmet, trying to avoid looking at the wobbling backside of the flatulent Homer Simpson look-alike in front. It’s not a Jules Vernesque adventure, it’s hell in high water and the very thought brings shivers to our collective spine. Fortunately however there is another form of Sea Trekking, one that is much more to our taste. Back in 2005, so the story goes, a group of youngish people who enjoyed hiking decided that walking around the coast was fun but what would be much more fun is if they added the sea to their hiking trails. 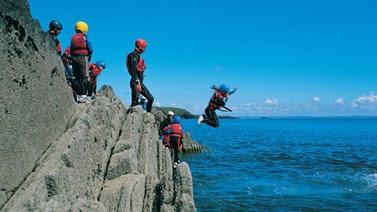 Ah, you might exclaim, they’ve discovered Coasteering. That sport where you hike around the coastal fringes leaping in and out of the sea etc. Err… Well… Yes and no. SeaTrekking combines hiking, snorkelling and freediving and although it shares some similarities with Coasteering it has several significant differences one of which is that unlike Coasteering, the SeaTrekker doesn’t see the water as an obstacle to be navigated, rather it is a part of a journey that should be enjoyed. SeaTrekking is about traversing coastal areas, travelling above, in and below the water as much as travelling on land. SeaTrekkers spend days, even weeks exploring the coast carrying everything they need with them and at night they camp beneath the stars on secluded beaches and coves. Some of you might consider such an activity as rather romantic, an escape from the rat-race, exploring the shores less travelled and spending long evenings starring up at bejewelled skies. Others however, might be thinking that it sounds like hippy nonsense. The sort of stuff that pot-smoking wasters, who still wear tie-dyed t-shirts and refuse to wash their hair, dribble on about. In truth, both points of view are valid. For a decade, he tinkered with ideas for how to keep his gear dry, sewing and gluing prototypes by hand in his basement. Finally in 2011, he contracted a company in Munich that make aluminum molds, and started commercial production. “Some people make a house, or a family,” Wache says. “I made a rucksack.” His new company Aetem, (which is similar to Atem the German word for "breath”) has plans to make new versions of the original waterproof rucksack, that will be better and cheaper. Although still relatively new, SeaTrekking is gaining popularity as a sport and a dedicated community of intrepid adventurers is cropping up in Europe, Japan and beyond. Wache’s company Aetem, also offers tailored tours along coastlines not normally accessible by foot. Thailand, Croatia and Sardinia are just a few of the locations that can be visited. SeaTrekking, with its adventurous spirit of exploration, love of nature and romantic notions of getting-away-from-it-all sounds marvellous but we do have a few issues. For instance the current waterproof bag, on offer on Aetem’s website, retails at over 900 Euros. That’s not cheap and even if the newer versions come in at half that price, that won’t be cheap either. Secondly there is that entire hippy, Gaia loving, anti-materialism stuff that fills the Aetem and SeaTrekking community website. In fairness there is nothing wrong with wanting to get back to nature, but it does sound a bit hypocritical if the way you go about “escaping everyday life” is to manufacture and sell a very expensive product and then move into the world of commercial tour guiding. Selling stuff seems a strange way of escaping materialism. These are minor issues however, born from too many beers and, in all honesty, a little bit of jealousy. You see, what Wache calls SeaTrekking, is very similar to what we’ve been doing for years (except we call it extreme snorkelling), we just didn’t think to try and make money out of it. But then nor did we realise that we needed to take a great big waterproof backpack filled with camping gear with us when we go for a days snorkelling, as we tend to have a 4x4 waiting for us at journey’s end. We like to call this: planning ahead. Then again, running a adventure tour company or designing a waterproof rucksack seems like a lot work to us and we’d rather be snorkelling. Nitpicking and jealousy aside, we think SeaTrekking is not a bad way of spending some free-time and if you are of bold spirit and are a good swimmer we’d recommend you give it a go because as once-in-a-lifetime underwater adventures go, SeaTrekking kicks the proverbial brown stuff out of Sea Treking. By the way we have joined the SeaTrekking community, we don’t know why but it seemed like a good idea at the time. We may however be posting some stuff on their website so why not have a look around now and again. On a cold February night, in an unremarkable London pub an argument broke out. The argument was long, heated and at times rather abusive. One bloke, called Bob, even walked out saying he just couldn’t reason with the others. He hasn’t been seen since. So what was the argument about? 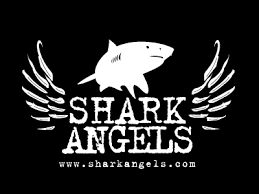 Well it was about the sad death of Rob Stewart, he of Sharkwater fame. There were seemingly so many questions surrounding the events leading up to his death. Why did Rob undertake a third deep dive of the day using a rebreather when he was relatively inexperienced with rebreathers and had never made such deep dives before? Why was the instructor the first out of the water rather than Rob (the student)? How did no one notice when Rob sunk below the surface again and “disappeared”? Why did it take so long to find his body considering it was eventually found 300 metres from his last known location? The questions just kept on coming and because no one had any answers everyone was forced to speculate and speculation leads to people called Bob making rude gestures and walking out. There is something troubling about the word “ninja” to us. Perhaps nowadays “ninja” means some technical wizard or superhuman that work wonders but to us a ninja is a shadowy Japanese assassin who didn’t like attacking people head on but instead preferred to attack when they were most vulnerable – when they were eating, asleep or on the toilet. Whatever Rob Stewart meant by the term, the ninja he got was Peter Sotis, owner and training director of Add Helium. Rob must already have known Peter, as he trained on Rebreathers at Add Helium back in August that year. Add Helium claims to have educated “more rebreather divers, instructors and instructor trainers than anyone else… Period” Peter Sotis allegedly regards himself as a leader in rebreather diving if not the leader and says his team “consistently pushes the limits as they explore deep walls in excess of 600ft” It could be argued that Peter was definitely pushing the limits on the day in question. Peter and Rob had already made two (hopefully planned) dives on the Queen Nassau, that lies in over 200ft of water off the Florida Keys. where Rob hoped to film the endangered Sawfish. The third dive however, seems to have been unplanned as it is alleged that the only reason that dive was undertaken was to re-cover a $15 grappling hook which had been placed on the wreck and was attached to a surface buoy that marked the location of the dive site. It was on this dive that Peter and Rob encountered difficulties. Accounts say that on surfacing Peter Sotis (the instructor remember) was first to board the boat, promptly collapsed and required urgent oxygen therapy. It was whilst everyone was attending to the instructor that the student, Rob Stewart, slipped back beneath the waves and sank to his untimely death. Three days later, following a search that encompassed miles upon miles of ocean, Rob’s body was finally located a mere 300 metres from where he had originally surfaced. At the time, very few people knew much about Peter Sotis and it is possible that if Rob had known a little more about his “rebreather ninja” he wouldn’t have been that eager to push the limits with him. For Peter Sotis seems to have a rather murky past. He is, for one thing, a convicted armed robber and is under investigation by the U.S. Dept of Commerce for selling Chinese made Scuba Cylinders with faked CE certificates. Perhaps worse still, Peter Sotis is under investigation by the FBI and U.S. Dept for Homeland Security for allegedly selling military spec rebreathers to Libyan Militants despite being advised not to by U.S. Authorities. There is conflicting information regarding whether the equipment in question really was military grade or whether the Libyans were terrorists but Peter’s own business partner, Shawn Robotka, also filed a lawsuit against him alleging that the sale was illegal, contravened U.S. arms embargoes and that Peter Sotis went ahead with the sale despite knowing that it was in fact, unlawful and that the buyer was a known militant in the region. Reports also say that a disgruntled shareholder has pulled his money from the Add Helium bank account forcing the company's closure. Peter Sotis and several other directors of Add Helium have now filed for bankruptcy. Which suggests that there will be little left to pay the Stewart Family should the court find in their favour. But then that is beside the point. As the Stewart family have made clear, this is not about compensation, it’s about safety. Rob Stewart's death was clearly preventable and by being so it is all the more tragic. But perhaps there is a silver lining in the cloud. 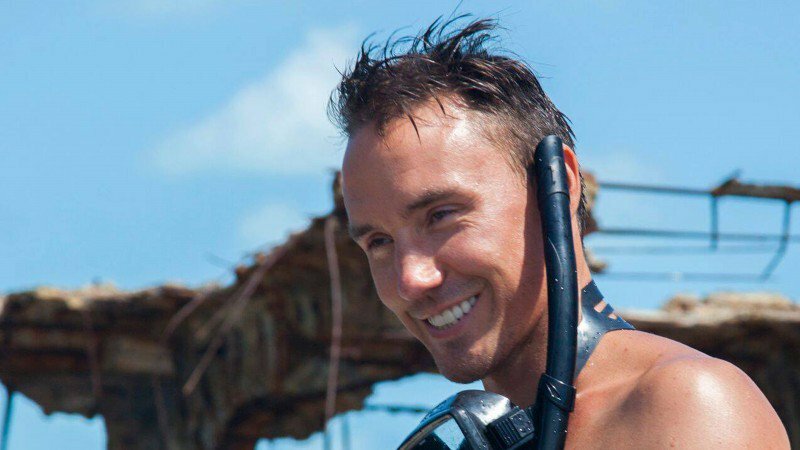 Rob Stewart wasn’t just another tourist that nobody had ever heard of. He was an accomplished SCUBA diver, photographer and world famous documentary maker. And it is that fame that will bring the ensuing court case to attention of the world. There are going to be a lot of people squirming uncomfortably in chairs soon and not all of those will be facing the lawyers in court. As the case unfolds a great many questions are going to be asked about the diving industry itself; about rebreathers, their use by sport divers and the whole training, licensing and regulation of those who claim to be diving instructors or even diving ninjas. For years we have been saying that there are far too many idiots in the diving industry, far too many charlatans and far too many self-appointed experts who want to push the limits. And for years people like Peter Sotis keep proving our point and yet the idiots still prosper and the deaths continue to rack up. Rob Stewart, one of the worlds greatest advocates for sharks, has become one more name on the diving worlds long list of needless deaths. How much longer will it be before the diving industry realises it has a bloody big problem? In February 2016 we wrote post about the spread of full-face masks. In that post and its forerunner we highlighted the fact that the full-face design is inherently flawed. We weren’t the only ones who had our doubts about these masks either. Even the manufacturers own literature pointed out a number of innate problems, one of which was, that if you attempted to swim whilst wearing the mask you soon found out that you couldn’t get enough air to breathe. In short if you got in to difficulty in the water and needed to swim for safety, you were going to have to remove the mask or risk suffocating. The full-face design also risks CO2 build up and if it leaks, vision and breathing are compromised simultaneously. As we said in posts, these are rather serious flaws in a mask that is marketed at people who don’t like getting their faces wet! Swimming, breathing and being able to see simultaneously are, you’d think, rather important for snorkellers and any mask that compromises all three so readily was, in our opinion, a pretty poor product all round. Judging by the comments we received, a great number of people had suffered serious problems whilst using full-face masks. One comment, however, stood out. That comment came from Guy Cooper. Guy’s wife tragically died whilst snorkelling in Pohoiki Bay, Hawaii. Now, we could write a dozen posts about what happened that day and a dozen more about Guy’s tenacious search for answers but we’d rather he told you himself. Below is the address that Guy gave to The State Drowning and Aquatic Injury Prevention Advisory Committee, Honolulu, Hawaii on March 15th this year and has kindly permitted us to use. We have not edited the address or amended it in anyway. This is Guy’s story and these are his words. I’m here to talk about snorkeling. I have to preface that by saying I’m by no means an expert. In fact, I’ve never been snorkeling. So, I’ll explain what brought me here. Many of you already know my story. I lost my wife to a snorkeling accident this past September. Soon as I got word, I caught the first flight over here. This is my third trip since then, trying to understand what happened— visiting the site, speaking and corresponding with police, 1st responders, ocean safety officials, doctors, divers and the woman who managed to get Nancy to shore. Pohoiki Bay was calm that day. Nancy went in the water with a buddy. As was her habit, she floated passively on the surface so as not to “scare the little fishes”. After about 30 minutes her buddy left her side to dive off the rocks. (He should never have done that.) Returning to the rocks after one dive, he realized he couldn’t spot Nancy. After some minutes of scanning the water, he heard and saw a woman surfer across the Bay waving her arms and yelling for help. A few young guys jumped in and helped her and Nancy to shore. CPR was performed, but she was gone. She had been in the water less than an hour, in Hawaii less than 24 hours. A little background. Nancy was 70 years old. She was not a novice snorkeler. nor a stranger to snorkeling Hawaiian waters. She swam laps nearly everyday. We had just hiked all over the hills of southern Italy. We enjoyed biking, hiking, snow shoeing, kayaking. As a young girl she was recruited by a professional water skiing team. Later, she organized river-rafting trips. She was always physically active and at home in the water. The coroner surmised she must have suffered some acute coronary event that precipitated her drowning. He referred to a known history of ischemic heart disease. Don’t know where that info came from. I was never asked about her medical history nor anything else for that matter. She had no such history, and even the physical findings of the autopsy contradict that conclusion. There seems to be a prevalent attitude amongst some over here (Hawaii) that dead tourists were old and in the way. To my mind, the heart attack assumption just makes the coroner’s job that much easier. So what did go wrong? I started thinking about that new full-face snorkel mask of hers. She was so eager to use it in Hawaii. She tried it out a few times in the local pool before the trip. She bought it on Amazon, so I started perusing those reviews. I was shocked to read of these masks having inherent, potentially lethal design and manufacturing flaws. And alarmed that they were being marketed as great for beginners, and kids. I expanded my search to various snorkeling and dive web sites and learned a lot. These masks have to be strapped tightly around the head to achieve a good seal, yet they still leak, sometimes copiously. Valves and other structures have been reported failing. Once they fill with water, there’s no easy, quick way to empty them. Your mouth and nose are captive together, so there’s no escape. You can drown in them. There are other reports of snorkelers experiencing air hunger, CO2 build-up and rapid fatigue. So you can fall victim to dizziness, disorientation, hyperventilation, panic and loss of consciousness. Then you drown. My wife was found floating face up with her mask partially pulled up over her nose so that both her nose and mouth were exposed. That tells me she was in trouble and tried to get the damn thing off, too late. I wondered if there were other reports of fatalities involving these masks. I looked up reports of snorkeling fatalities and near drowning incidents from around the world. That’s when I realized, my god, no one is paying any attention! Not one mention of the gear. My wife’s mask was just tossed in the trash. These things could be killing others, and no one knows! Not only are the risks unrecognized, but I could find no evidence of any independent testing or certification of these things. Wouldn’t you want to know if these masks represent a significant danger? I started to educate myself about snorkeling in general. I found it is not exactly the benign, lightweight activity it’s promoted as being. Many significant physiologic stressors can come into play. The Australians have coined the phrase Fatal Silent Snorkeling Syndrome. The Japanese use the term Takotsubo, referred to as the “Broken Heart Syndrome”. A study out of the Temple University School of Medicine in Philadelphia identifies a number of inherent stressors. Dr. Douglas Smith, from Hawaii, promotes Slow, Safe, Snorkel Breathing techniques to counter some of the ventilation issues arising from the sport. The whole subject of snorkeling physiology begs further study. So on one hand you have an activity rife with significant physical demands, then you exacerbate the situation by adding a new piece of inadequately vetted equipment with inherent design flaws. A perfect storm. Look, I’m aware of the demographic considerations. Hawaiian tourists, like the population in general, aren’t getting any younger. Many are probably over-extending themselves in this age of “active lifestyles”, and Viagra…. That’s all the more reason to fashion a robust, realistic tourist education effort that both alerts the public to the challenges of snorkeling and teaches them the skills they need to ameliorate the risks. That will help ensure that the tourists return from their vacation healthy and happy and pass on their positive experiences to others. All I ask is that you give serious consideration to the role of these new masks. Devote the resources to collect the data. Incorporate the data in incident reports and data bases. Look for trends. Make the coroner aware of their use. Secure the gear as evidence. Only then will you truly be able to assess the risk. Some have said there just aren’t many of these new masks out there yet. No action needed. I suspect there will be more. It could be that my wife’s death represents the very first fatality involving a full-face mask. Well, one’s enough for me. Nancy Peacock’s death was a tragedy but there have been tragedies before. Hawaii has a notorious reputation for snorkelling related drownings and one more fatality in those sparkling waters could easily have been passed over were it not for one man who kept asking questions. Since Guy gave that address, Lifeguards in Maui have begun tracking equipment worn by snorkellers who drown in their jurisdiction and other counties of Hawaii appear poised to do the same. Health officials and safety experts in Hawaii are looking at collecting the data necessary to better evaluate full-face masks and possibly even conduct controlled scientific studies on it and we’re sure that it won’t be long before other officials from other nations start doing the same. Guy Cooper may, single-handedly, brought about the biggest change in snorkelling safety ever! The full story and further material can be found on the Civil Beat website - follow the links. Again we liked to thank Guy for letting us publish his address in full. We wish you all the best Guy and as snorkellers, we thank you. The Intova Edge X was made for the water. It was the first completely sealed action camera, it was waterproof to 60 metres and was protected by a tough rubber armoured shell. It also had everything that any water fanatic or adrenalin junkie would want including GPS, WiFi and an array of other technical things to excite the amateur underwater photographer. It was great and we liked it so much we bought one. Now though, our beloved little armoured friend has developed the rather irritating problem of freezing up. Yep, just when that huge barracuda came into the view or that massive shoal of fish headed straight for the lens, the Intova decided to throw a wobbly and froze. Now, due to the fact that the camera’s warranty had expired, the only way to solve this problem was to open it up and carry out a reset procedure or hurl it hard against a wall. Neither though, are very practical solutions when in the water. So as we begin planning our trips for 2017 we’ve come to the conclusion that we are going to have to relegate the Edge X to a minor supporting role and give the lead to another camera but which one? A few years ago buying an action camera was easy; you walked into a shop, asked for an action camera and were promptly sold a small box called a GoPro. Nowadays though, there is so much choice out there, it is hard to know which camera is best. Fortunately however, there is a font of knowledge within easy reach. Just a few clicks on the old trusty computer and hey presto the interwebby gods will present you with a cornucopia of reviews. In fact, there are so many reviews out there you might start to think that you are the only person on the planet who hasn’t looked at, compared, tested and studiously examined every inch of every camera that has ever been made. Which presents another problem. Which review do you believe? Is the reviewer really independent or are they being paid to review the camera, in which case was it an advertisement masquerading as a review? And, perhaps more importantly, does the review actually help the decision making process? Well let’s put it the to the test. We’re going to look for a new action camera and buy the one the reviews say are the best. As we liked the Intova Edge X so much, we should probably start with the Edge X’s direct replacement the X2. The X2 is a striking looking camera and if looks alone were what we were going for then we would already have hit the add-to-cart button on this one. But looks aren’t everything are they? So what do the reviews say. All the reviews highlighted the X2’s inbuilt flash/video light and the fact that it can take 16mp photos as opposed to the 12mp that is common for this class of camera. The X2 also has a 2 inch LCD screen so you can see what you’re shooting, is waterproof to 60m and like the Edge X is surrounded by an almost indestructible rubberised shell. Priced at £300, give or take a few pounds, the X2 isn’t the most expensive camera out there and every review seems to be in agreement: The X2 is a small, rugged camera designed to go anywhere and capture that “adventure”. In short, everyone seemed to like it. Which doesn’t really help does it? Then there is the niggling thought that although Intova have added a light and made the camera better looking, the software issue that affects the Edge X may also affect the X2. And, it will probably affect it exactly one day after the warranty expires too. 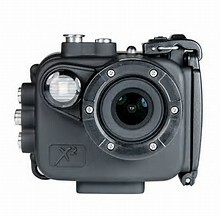 That said though, we like Intova and as all the reviews confirm, the X2 is a well-designed camera that seems to suit our needs. But, before we calm our niggling doubts over the software with some cold beer and part with £300, is there anything else out there that’s better? Well Intova isn’t the only manufacturer we like. Last year we bought an Olympus TG-4 and we liked it a lot. Now Olympus has launched its own action camera onto the market. 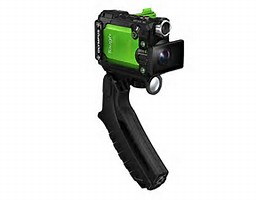 It’s called the Tracker and unlike most manufacturers in the sector, Olympus have not decided to follow the GoPro box design but have gone for a smaller version of a traditional camcorder design. 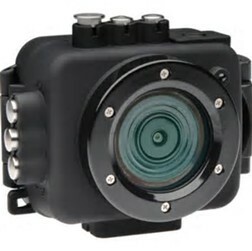 Being part of the Tough range of cameras the Tracker is freezeproof, crushproof, shockproof and waterproof to 30m. The Tracker has an inbuilt light for shooting in low light and has an auto detect feature that automatically senses it’s underwater and switches to optimal mode for shooting beneath the waves. It also has a wide angle lens and one of the fastest shutter speeds of any camera in its class, which means it’s great for action shots. The Tracker looks good too. So what do the reviews make of this camera? Well, everyone liked it. They really did, it got a 5/5 in some ratings and depending on the retailer, you can pick up a Tracker for less than £270, which makes it cheaper than the X2. The Tracker also has 4k video resolution unlike the X2. However, the X2 has 16mp resolution whilst the Tracker has only 8mp. Now some reviews pointed out that the Tracker’s LCD screen only flips out rather than flipping out and rotating. Now if we had a problem with flipping screens not rotating then this could be deal breaker but we don’t. So there you have it. We are going to push the X2 aside and buy a Tracker. After all, the reviews all say it’s great. But then they said the X2 was great as well didn’t they? Err… This is getting confusing. Maybe we should look around a bit more. See what else is available. After all, we haven’t even considered the elephant in the room yet have we? We are of course talking about the GoPro Hero 5 Black. The Hero 5 sits like a smug cat atop the ever-growing pile of GoPro imitators that exist in the action camera sector, according to some reviews at least. Now we have never really liked GoPro’s. We never liked the boxiness, the lack of a view screen, the unbelievably expensive range of accessories and the sense that if we ever bought one we’d have to grow our hair long, dye it blonde, take up snowboarding, start using the word “radical” in everyday conversation, change our name to Tristan Hansard-Faffyman and become friends with Gareth “I own a fairtrade coffee shop” Beardybloke. You know what we mean here. GoPros' were for Lycra-clad nutcases on overpriced bicycles or baggy trousered snowboarders that hurtle down the slopes knocking everyone else over. They were not for snorkellers, freedivers or bubble blowers. But GoPro seemed to have picked up on this and made the GoPro Hero 5 more appealing to people who don’t shout all the time. Firstly it has an inbuilt 2 inch LCD screen so you can frame the shot. It has 4k video resolution, shoots 12mp photos, has an easy to use touch screen menu and comes complete with all the usual accoutrements of WiFi, GPS, video stabilisation and the rest. What makes this model really appealing is the fact that it is waterproof to 10m without a separate housing, making it perfect for snorkelling. Anyway what did the reviews say? Well, rather disappointingly, they all loved the Hero 5. Praise was universally gushing and it even got 5/5 on some reviews. People even praised the box it came in. It’s like wanting a sports car isn’t it? If you can afford a Ferrari why buy a Porsche. Likewise, if you can afford an expensive camera, why buy anything other than a GoPro Hero 5. 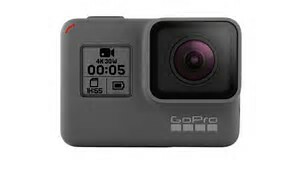 Unless of course you realise that the GoPro 6 is due out later this year and in the world of shouty Tristan’s and lycra-clad cyclists, owning a 5 when a 6 is available is like getting your coffee from McDonalds rather than Beardyblokes Shangri-La Native Coffee Emporium. It’s just not fashionable and not being fashionable means that Tristan’s sister Jemima, nor any of her friends, will want to sleep with you. Yet the Hero 5 is still very popular and there is no doubting the quality of the video or photographs that are produced, so maybe it’s time to swallow our pride and join the shouty set. After all, all the reviews recommend it don’t they? So it is the one for us. But wait. Maybe our prejudices run too deep and maybe we’re happy to be the only people in the pub who haven’t slept with Jemima and her friends so surely there must be another camera out there that stands up to the GoPro? 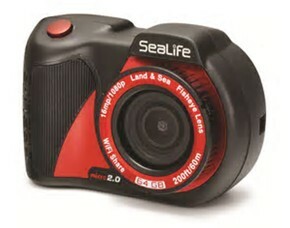 What about the SeaLife Micro 2 HD or the new DC1400 or the DC1200 elite? What about the Nikon KeyMission 170 and then there are the cheaper versions like the Veho Muvi series, the Garmin Virbin or even the iSaw Edge? What do the reviews say about them? Well, that’s the problem really. All the reviews like all of them. So we’re back to square one really. We want to buy a camera but are not sure which is the best so maybe we should ignore the reviews altogether and just set some parameters. The camera should be waterproof without a housing. It should be easy to operate underwater. It should be able to take 12mp images or above. It should be compatible with Intova and GoPro clips and accessories and it should be less than £500. Right, that’s the Intova X2 then. Oh, but wait, that doesn’t have 4K! Well it’ll be the Hero 5 then… But wait, do we all want to change our name to Tristan? It’s the Olympus Tracker then. But wait that doesn’t do 12mp and the screen doesn’t rotate and maybe that will be a problem. Ohh…. This is becoming ridiculous… We’re going to need to read some more reviews. Visit some more photography sites and do an in-depth comparison. Barman, we’re going to need more beer… Or maybe… We can get the Edge X fixed. Right… Camera repair shops; which is the best one? Is this any good? How should we know? Goodbyeeeeee. Sport Diver UK Chucks The Wetsuit Into The Corner And Heads Off Into The Sunset. If you have not already heard… Then Brace yourself, for we bring you shocking news. 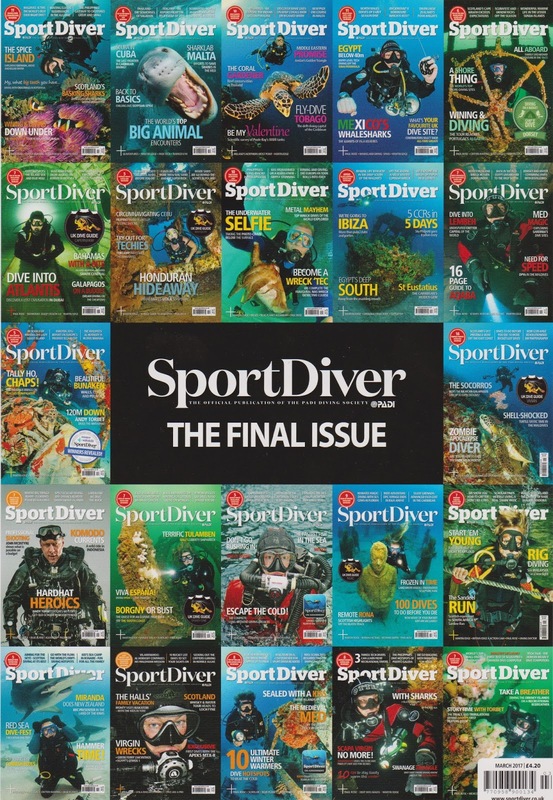 Sport Diver UK magazine; the official PADI journal for Europe and the Middle East, a stalwart of the diving media for decades, is to cease publication. The final edition is already on the shelves. No doubt, like us, you are stunned at this news and are currently starring wide-eyed at the computer screen, mouth agape, perhaps with a stream of dribble running down your chin and dripping messily onto your keyboard. We know, we know. A world without Sport Diver UK! A world without the musings of Mark Evans, Will Harrison, Paul Rose or Martin Edge, how will you survive? Who will explain to you that the Red Sea has the best diving in the world or that Thailand has the best diving in the world or that the Bahamas has the best diving in the world or that Mauritius has the best diving in the world? Where will you get all your medical advice from, now that the Dive Doctor has packed up his stethoscope and gone into private practice? How will you know what to wear without Scubalab telling you which wetsuit is pre-eminent and which baseball cap is de rigueur this season? And, how will we all find out what new and inexpensive diving course the PADI organisation has developed to expand all the world’s diving knowledge and, more importantly, its dive badge collection without this glossy-paged magazine. Okay. None of you are thinking this are you? You’ve probably never even heard of Mark Evans or his cohorts. And, even if you did, you didn’t really care. You get your medical advice from your own doctor rather than a column in a monthly magazine after all. You don’t care that the best diving in the world could be found in the exact same place that Sport Diver happened to be visiting that month and no doubt think that Scubalab is Aquaman’s secret hideout rather than an equipment-testing column. News of the sudden demise of the magazine that Mark Evans spent eighteen years of his life editing will probably elicit nothing more amongst the bubble-blowing masses than a gentle raised eyebrow or the shrug of an uncaring shoulder. Which may explain why the magazine has hit the rocks in the first place. 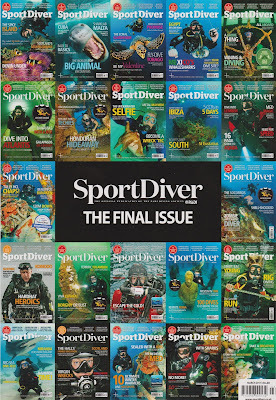 Now, as far as we are aware the owners of Sport Diver UK, Bonnier International Media (who only bought the title back in 2013), have not been forthcoming in their reasons for ending the magazines existence. Even in his final editors letter, Mark Evans, doesn’t really explain the underlying rational behind the decision to cease publication of what he himself calls a “major player in the marketplace”. And yet, in that final letter, the reasons become all to clear. For starters, as we’ve rather heavily hinted at, the vast majority of you water junkies and bubble-blowers out there didn’t give a rats hairy bottom about Sport Diver and we suspect you had good reason for this. A quick trek through the online diving forums and you get a feeling for why the magazine ran out of air. You see gear reviews on gear that is either mediocre or overpriced. You also see things like "top 10 wetsuits" where the really good wetsuits aren't even listed. I think it's mostly just advertising. Even with reviews, you'll notice, you won't find anything negative about anything. Print editorial is too afraid to piss off a manufacturer who may pull advertisement funds. Though, it is also relevant for online publishing. 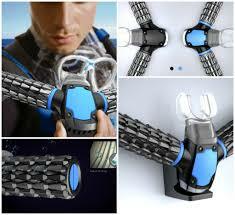 Scuba is such a small niche that there are only a handful of manufacturers with deep pockets. You don't want to tell potential customers to stay away from some of their products; it is not what companies pay for. Thus, you get all kinds of review articles that are so bland, feel like whatever you buy, you won't go wrong. There is simply no critique anymore other than on forums by private entities. I'm just surprised people haven't got how much they are being conned into paying for a catalogue every month. Some of the articles are so obviously just filler. I stopped reading it regularly when the percentage of content about overseas diving went over 90%. I know there's not a massive amount to be written about UK diving, but not everyone can afford to travel overseas for dive trips all the time. I was a subscriber but constantly wondered why. It was just an excuse for free jollys for the editor and assistant. Content was poor, and was miles behind Diver Magazine in every department. A new editor who actually gave a monkeys about turning out a decent read may have worked wonders. Well, it doesn’t take Sherlock Holmes to figure out that the general consensus was that Sport Diver UK was getting things badly wrong. They focused on pleasing advertisers rather than readers. Features became irrelevant fillers, equipment tests became bland and uncritical whilst more and more pages were turned over to advertisements. The result was the readership turned off and without readers; advertisers had no one to sell to. Rather ironic isn’t it that the desire to make money from advertisers rather than from sales of the magazine would deliver the deathblow. 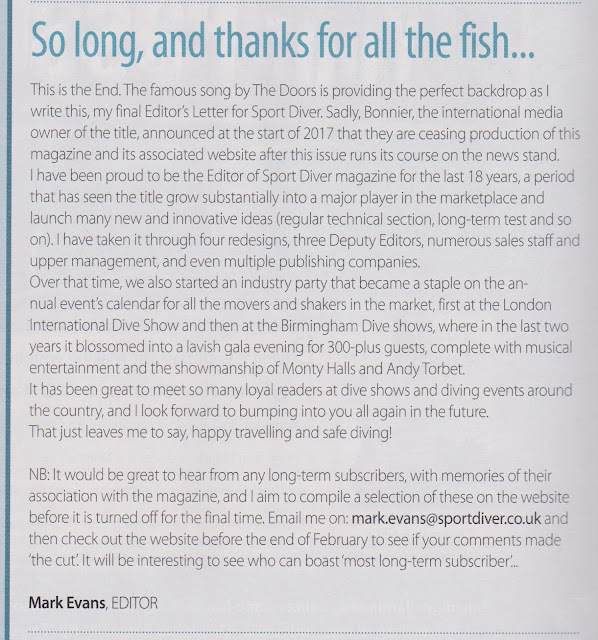 We could of course be wrong; Sport Diver might just have a great respect for its readers, but before you decide that let’s go back to that final letter from the Editor, Mark Evans, entitled “So long and thanks for all the fish”. 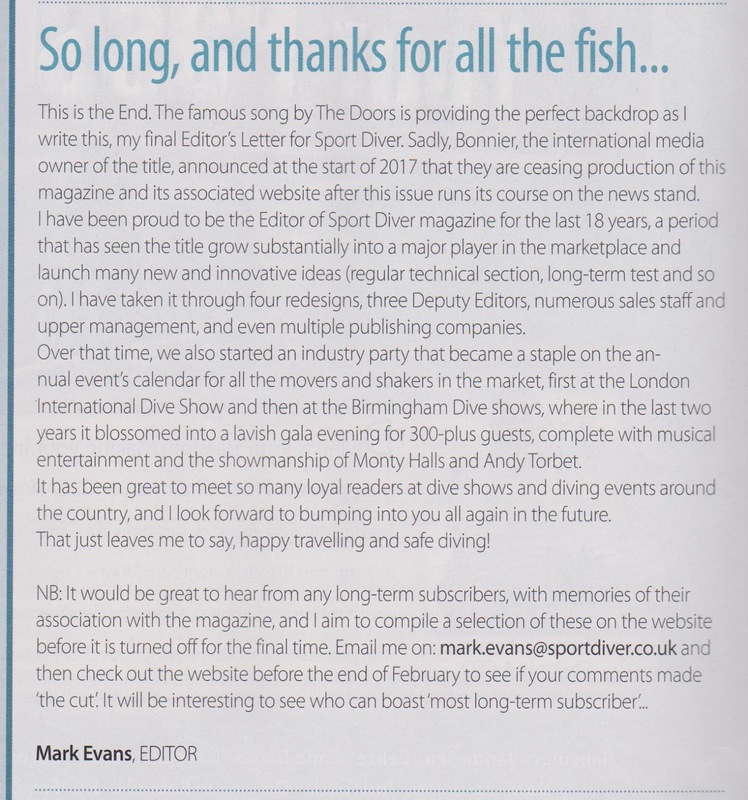 Now we don’t know about anyone else but what we took away from that letter was that Mark’s and Sport Diver UK’s greatest achievement as a whole was holding a party for all the “movers and shakers” in the diving industry. A party that was so good it became an annual occurrence and in the last two years became a “lavish event” for a select few hundred with musical entertainment and the “showmanship of Monty Halls and Andy Torbet”. Err… Wow. Looks like Mark and friends really have a lot of fish to miss. Anyone who’s a fan of Douglas Adams’ Hitchhikers Guide To The Galaxy books (as Mark Evans clearly is) will no doubt know that the Hitchhikers Guide was an electronic travel guide originally published by Megadodo publications. Megadodo was an organisation that regularly relocated its editorial offices for reasons of climate, local hostility or tax concerns, had little time for it’s readership and finally lost all credibility with said readership when it relocated to a resort planet. Maybe that’s what Mark and the other members of the Sport Diving team thought they were: Megadodo employees. Maybe it really was just one long party of diving, cocktail sipping and going to industry parties with the occasional chore of writing something down and publishing it now and again. If so, then the gravy train has finally hit the buffers and Mark and his cohorts will have to sober up and seek alternative employment but who can blame them for having a party for as long as they did? Apart, maybe, from all those Sport Diver subscribers, who are probably not going to be all that impressed with the “it’s been a blast for us” message.  If, on the other hand, Mark and his team (and there have been a lot over the years) truly were interested in delivering a quality media product to the diving fraternity then sadly they have failed and that failure should be a lesson to all others who are thinking on embarking on such a business model. Yes you can make money from advertising but for god sake, make sure you have a readership to advertise to! So Sport Diver UK wasn’t very good and has paid the price for its mediocrity but why, you may be asking, are we so bothered about its demise? Well for one thing, it’s a PADI publication. Which means it has had us in fits of laughter over the years (although probably not intended) and we will miss the giggles. For another it has given us endless material to poke fun at, from editorials that contradict themselves and the “you’ll love this new piece of equipment” reviews to the endless recycled features about Egypt, Thailand and Mauritius et al. But there is another reason. Sport Diver has been around for years in one guise or another and like a lot of things that have been around for so long it becomes familiar, it becomes comfortable. Sport Diver was like the old regular in the local bar. The one who sits in the same spot and always seems to be there mumbling to himself. Yes, he bores you to death with his endless anecdotes, often talks nonsense and never ever turns down a drink but without him the bar seems oddly different, less recognisable. Despite its many, many flaws, we’ll miss Sport Diver UK, we really will. On the upside though there is still Diver Magazine. In March’s edition, a guy called Steve Warren argues that when PADI entered the UK it was more professional than BSAC, particularly when it came to charging fees for training. Steve goes on to say that the drive for cheaper training and the subsequent failure to charge high fees is endangering the quality of training and destroying the livelihoods of trainers; although he then argues that PADI are the biggest culprit for doing this. It’s an interesting piece and has provoked some long guffaws over the beer. So goodbye Sport Diver UK and thanks for all the laughs. Hello Diver Magazine, we look forward to all the laughs to come. The Easybreath Full-Face Snorkelling Mask. We Don't Know Why You Need It. The Dangerous Snorkelling Club 2011-17 all rights reserved. Awesome Inc. theme. Powered by Blogger.